The Cat on My Head’s Giulietta shows off floofy furs in Caturday Art. 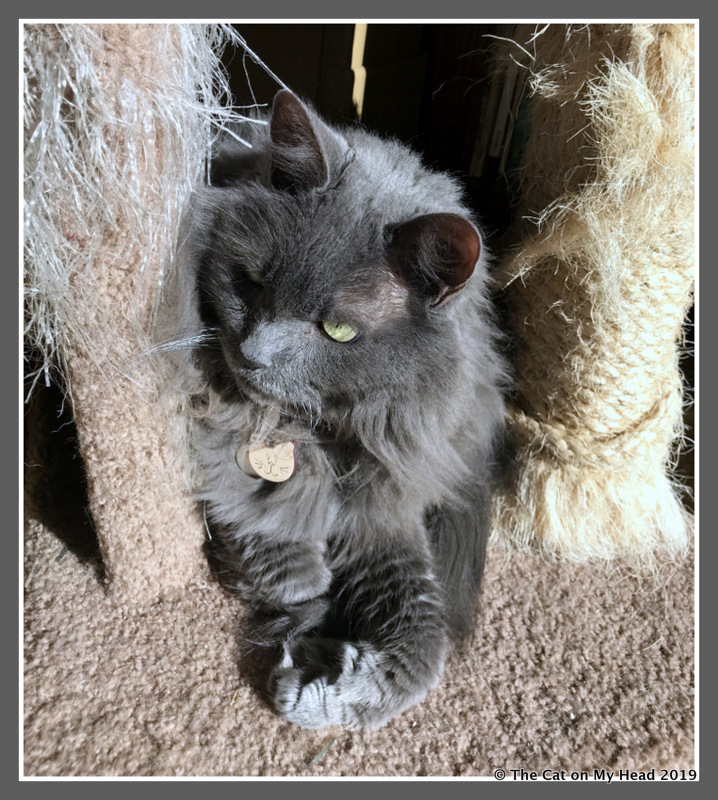 Giulietta was enjoying one of those kitchen sunpuddles today when I snapped the photo that led to today’s art. Here’s the original. As you can see, Giulietta has regrown all her floof after getting a lion cut near the end of summer. I know I did this backwards this week showing the original photo first. Hope you stuck around to see the art version. To create this art, I used the Leona effect from the Picas.tech app. 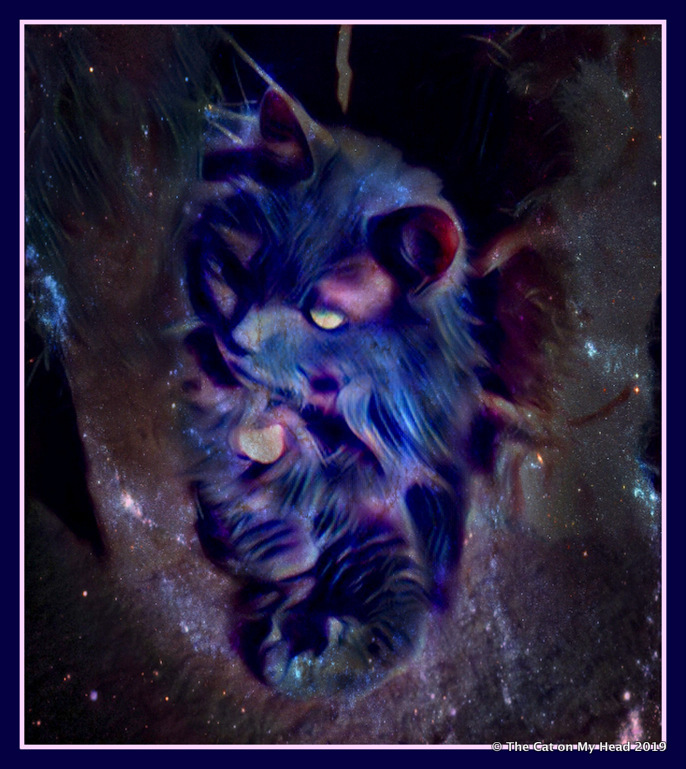 Then I added the Milky Way effect from piZap at about 80 percent. I lightened the photo in Picasa before using it to add the borders. I haven’t offered you a puzzle in a while, so I have made one from today’s art. Click on the thumbnail to go to Jigsaw Planet to work the puzzle. 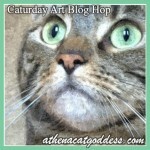 Giulietta is joining the Caturday Art blog hop hosted by the lovely Athena Cat Goddess Wise Kitty. If you’d like to join in with some art of your own or see the talents of your fellow bloggers, click on Athena’s badge. Tomorrow is our weekly blog hop. We are delighted by how many of you continue to join us each week, and especially to see some newcomers. This is your early warning to start sprucing up your furs in anticipation of showing yourself off tomorrow. Your host is till a mystery, so you’ll need to drop in to see which one of us shows up to greet you. Until then, stay warm and cozy! Your artwork is pawsome but you are so beautiful it couldn’t be anything but pawsome. Almost 30 minutes to puzzle…wow! I love the challenge, and Giulietta, you are beautiful! Eastside Cats recently posted…Hydrate At Your Peril! That is a beautiful effect. Thanks for the puzzle. I will be back soon to do it. The puzzle took me a long time! I will come back tonight and try and improve. My excuse is that the sun came out and was dazzling me. It is such a rare occurrence lately so I didn’t want to shut it out! Well I did come back and knocked a couple more minutes off the time but it still took me 29m 14s. Maybe I shouldn’t have blamed the sun the first time. That sure is a dreamy one sweet Giulietta! Giulietta you have your furs back! Lions need fur in the winter (!). Love the way your Mom artified you in the second photo………beautiful colors and you look EXTRA soft. I love what you did with the photo! Very cool art this week.